To observe a dog's guilty look. to witness a gorilla's self-sacrifice for a wounded mate, to watch an elephant herd's communal effort on behalf of a stranded calf--to catch animals in certain acts is to wonder what moves them. Might there he a code of ethics in the animal kingdom? Must an animal be human to he humane? In this provocative book, a renowned scientist takes on those who have declared ethics uniquely human Making a compelling case for a morality grounded in biology, he shows how ethical behavior is as much a matter of evolution as any other trait, in humans and animals alike. World famous for his brilliant descriptions of Machiavellian power plays among chimpanzees-the nastier side of animal life--Frans de Waal here contends that animals have a nice side as well. 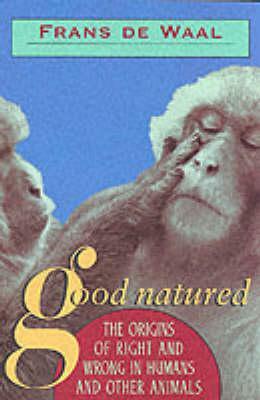 Making his case through vivid anecdotes drawn from his work with apes and monkeys and holstered by the intriguing, voluminous data from his and others' ongoing research, de Waal shows us that many of the building blocks of morality are natural: they can he observed in other animals. Through his eyes, we see how not just primates but all kinds of animals, from marine mammals to dogs, respond to social rules, help each other, share food, resolve conflict to mutual satisfaction, even develop a crude sense of justice and fairness. Natural selection may be harsh, but it has produced highly successful species that survive through cooperation and mutual assistance. De Waal identifies this paradox as the key to an evolutionary account of morality, and demonstrates that human morality could never have developed without the foundation of fellow feeling our species shares with other animals. As his work makes clear, a morality grounded in biology leads to an entirely different conception of what it means to he human--and humane. Frans B. M. de Waal is C. H. Candler Professor of Primate Behavior in the Psychology Department and Director of Living Links, part of the Yerkes Primate Center, Emory University.